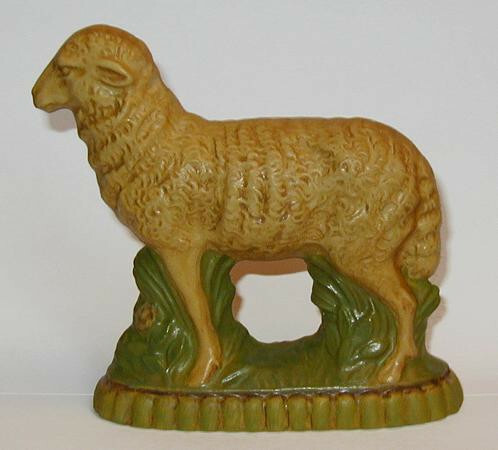 Bring a piece of New England folk art into your home for the holidays with this hand crafted Yelloware Lamb. This wonderful piece was inspired by Early American Yelloware, hand crafted using an antique German chocolate mold. The art of molding plaster of paris/chalkware, into holiday treasures is a centuries old German tradition. Bittersweet House Folk Art brings together the German tradition of folk art chalkware with the warmth and charm of yellowware bowls from early American colonial days and offers a unique, hand crafted treasure that will last a lifetime. 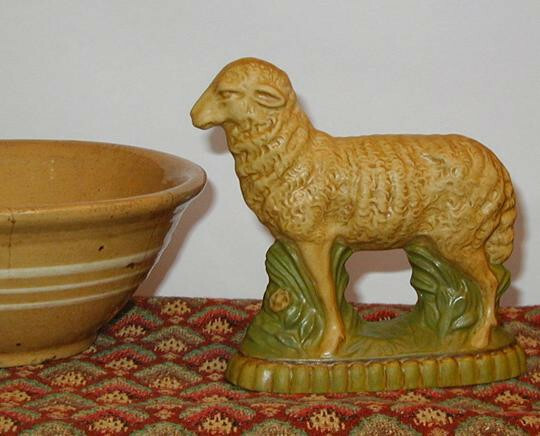 Offered here is a limited edition, Chalkware Yelloware Lamb. Of special note: molded in chalkware using a rare antique German chocolate mold, measuring 5 - 1/2 inches, handpainted with my Signature Yelloware finish and green Glazed base, hand signed "Bittersweet House Folk Art, K. Campbell." The piece has been antiqued and polished to give it the beautiful appearance of an early Yelloware bowl and is designed to display beautifully with yellowware, redware, mochaware pottery collections. 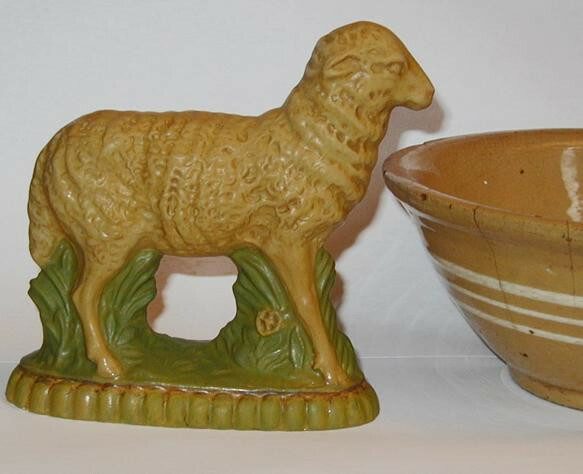 Let me know if you would like to order the Lamb with an all over yelloware finish-without the green glazed base.